Teiji is a tall teen with a massive amount of muscle weight. At a young age he was taught to wear bulky clothing to hide his true size. He was later brought to a genjutsu teacher who taught the boy to mask his true body size with relatively small amounts of chakra. His hair is most often allowed to fall loose. His hair is blonde and his eyes are blue. He wears a small, thin pair of reading glasses when the moment calls for it. He also wears traditional samurai city garb, which hides the armor that protects the right side of his body. He wears a samurai's mempo and wears his family's shield on his back, a symbol he carries with pride. Personality: Quiet and stoic. He is not outgoing but is friendly if approached first. Teiji does not actively seek battle but is always happy to join a skirmish if the situation arises. 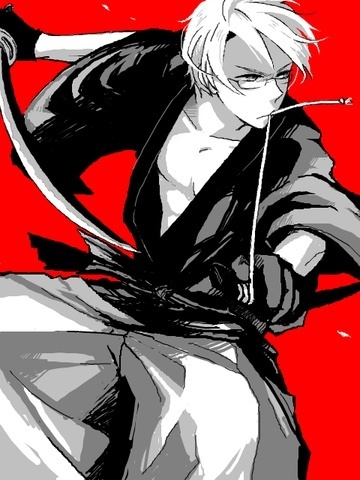 He protects Iwagakure with an unbridled passion if called to do so. He holds a deep respect for his father, often attributing him for teaching Teiji things that Teiji had learned on his own or from someone else. He doesn't mean to lie in this fashion, but his mind often plays back memories in this way. As such he also holds an untold amount of respect for his families lineage. Teiji is very protective of those he calls friends, often jumping into harm's way to protect them. He's slightly gullible, especially when it comes to women (he's not like Miroku or anything, he just kinda shy when it comes to women and can be easily tricked by them). Description: Makes the user extremely hard to move. This weight also causes the user to move more slowly but they have much more momentum. Description: A powerful forward thrust, utilizing the shoulder for the attack. The less distance traveled to the victim, generally the more powerful the actual hit is. Teiji uses the in combination with his shield or his Lead Foot jutsu, increasing his momentum by either the added area or the added weight. Description: Not so much a genjutsu as it is the cancellation of his ongoing genjutsu. The breaking of his genjutsu cost more chakra than maintaining the illusion but increases his bulk and strength to their normal levels. Description: Summons up stalagmites. This ninjutsu is used for traps or as a harmful ninjutsu. Description: The users fist is surrounded by a charge similar to that of a high powered stun gun. The target is electrocuted, stunned, and hit with a concussive blast of sound. Description: A clone is made from solid rock. The clone is less maneuverable but much sturdier and are great for stopping melee attackers. Description: Retsudo Tenshou is a Ninjutsu technique utilizing the Earth Element. This technique allows the ninja to control nearby stone and rock. When the ninja forms the needed handseals and slams their palm to the ground, surrounding rock will begin to churn and twist up crushing all those trapped within it. Description: Doryou Dango is a Ninjutsu technique utilizing the Earth Element. After striking the ground with his hands, the user is able to overturn the earth into a large dumpling shape chunk of earth the size of a mausoleum. Using his immense strength, he can lift up the ball and hurl it at his opponent, flattening all in its path. Description: The user brings their hands together quickly. As the air between the hands is super heated quickly it sends a mssive shockwave out, momentarily deafening the target and blasting them back a short distance. Description: The user leaps into the air and barrels down on the target knee first. History: Teiji was born to the leader of the Yoritomo clan. He was brought up in the normal fashion at the time, as a samurai until he was 12. Realizing the potential of the ninja way, his father switched how the clan would train and they quickly gained clout in the city of Iwagakure. Teiji himself was too old to enter the academy so he was trained by some of the local jounin in the same manner his father had secretly been doing for years. His training went exedingly well and he was able to be put into the chunin exams at the request of his father.